TrésoR® is a unique range of French super premium humid food for Dogs and Cats. 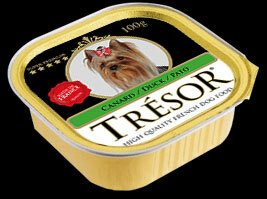 TrésoR® range offers many flavors: Chicken, Duck, Turkey, and Salmon for dogs and Salmon, Chicken and Tuna for cats. TrésoR® is presented in golden aluminum cans, and is available in two sizes: 100 and 150 grams. 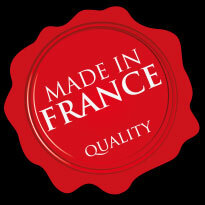 In France, we are very concerned about the quality of ingredients! TRESOR is 100% made in France, prepared with all the care we required in French gastronomy. Our nutritionists selected tender chunks of fresh meat and fish. Delicately cooked, they are then enriched with vitamins E and B and minerals essential for your dog and cat’s health. The appetizing look and perfect digestibility are ensured by the exclusive use of natural ingredients with no chemical coloring or preservatives agents. Thanks to TrésoR®, every day your dog’s and cat’s culinary dreams will come true. Our veterinarians work on new flavors to bring the best of French gastronomy to your favorite pet.